Appearance: Manji looks to stand about 6’ tall with a thin, rangy build. He is heavily scarred from his many battles that he fought and has three prominent scars on his face. One runs across both cheeks and the bridge of his nose, another runs along his forehead, and the third is vertical, run through his right eye (which is blind). Manji’s hair is a short disarrayed mess worn in the traditional topknot. Manji’s most telling point is his current state of mind. Manji has become a bitter, world-weary cynic, who recognizes the disparity between the samurai ideal and what happens in the real world. Disgusted with the actions of his lord, Manji killed him, instead of doing the “proper” thing and serving him faithfully, thus proving his (Manji’s) honor as a worthy samurai. He has, to an extent, become disgusted with the willingness of the samurai to die for the cause, no matter how pointless the cause may be. His newfound cynical outlook has made him somewhat less than civil and gracious, such that Master Sori wonders if Manji was abandoned as a child and raised by monkeys. Manji is also disgusted with his current state. A former samurai in the service of Lord Horii Shigenobu, Manji became disillusioned with his life and the code of the samurai after he discovered that that criminals he had been killing on Horii’s orders were really farmers trying to contact the local authorities to inform them of Horii’s misuse of taxes. 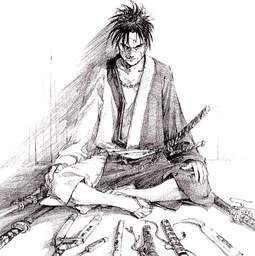 Manji killed Horii in return, and then killed 99 police officers who attempted to bring him in. Finally, Manji killed Saito Tatsumasa, right in front of Saito’s wife, Machi… who just so happened to be Manji’s little sister.